Deep just won a Best of The Bay Award for Best Block-Rockin’ Bike in the city. Score! It’s all kinds of awesome whenever someone wins one of those one-of-a-kind awards that the writers of the Guardian made up specifically for that person. That’s a very unique gift, it’s a very public compliment that was just broadcast out there for all of San Francisco to see. Definitely gives you some unique street cred as well. I got to the Embarcadero Plaza at exactly 8PM. No flashdance party but there was something else going on. I went over to investigate and discovered that some high school kids already had their own flashmob going on and were breakdance fighting. Awesome! That Hansel is so hot right now! 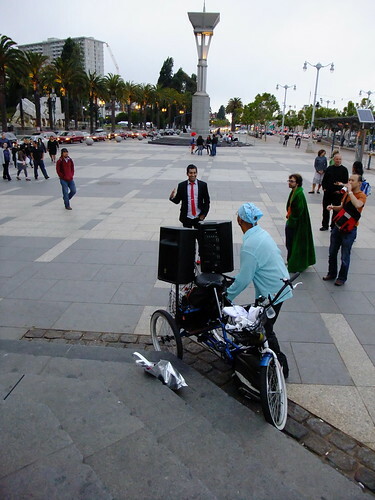 Anyhoo, my party was setting up nearby at the Ferry Plaza. And into the night it went. I really like this part of town. 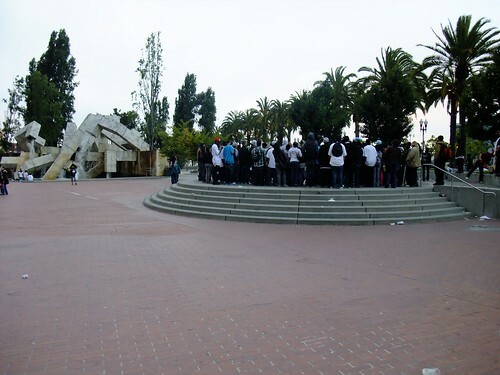 The Embarcadero is a great location for flashmob types of events. This is where Critical Mass starts every month. This is also where they had the Valentine Day pillow fight that caused $30,000 in damages to that god-ugly fountain and was the catalyst for the city’s Death of Fun campaign. It’s almost a textbook definition of how to create a Temporary Autonomous Zone. Normally it’s occupied by skaters, tourists, and homeless guys passed out in a pool of their own vomit, but I really like it. I live for free outdoor parties and it’s the renegade ones that have that added thrill that acts like a magnet and attracts some of the more interesting people in this city. This party is fast becoming one of my new favorite San Francisco rituals. Rad video of the parties Bollywood peak from raunet. 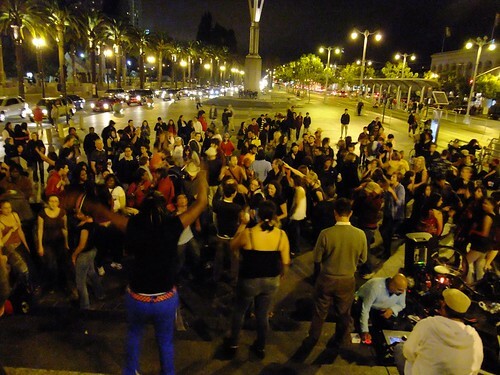 I’m telling you, The Embarcadero is an amazing place for renegade parties. It has a lot of character.